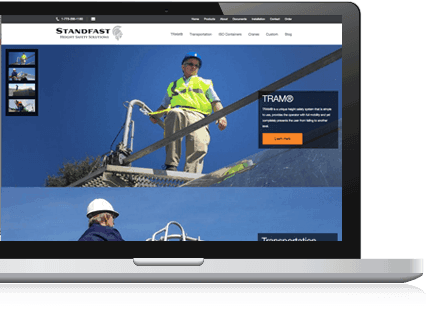 Standfast USA is a leading designer, manufacturer and distributor of fall protection systems and height safety equipment for the transportation industry. Founded in 1999, the company’s mission is to develop the best height safety products on the world market. The Standfast Group has grown to a global organization with offices in the USA, Australia, Europe and Asia and provides height safety equipment to some of the largest oil and gas, construction and mining companies in the world. Standfast USA is headquartered in Chicago, Illinois. We needed our website to be responsive so that trade show attendees could see the website while at the trade show. Connor O’Brien, Marketing & Commercial Business Manager, began working for the Standfast USA family business in mid-2015. With prior experience in digital marketing, web development and branding, Connor spearheaded the effort to evaluate Standfast USA’s web presence, and in late 2015, Standfast USA decided that it was time to update its website. Built in 2010, its previous website had become outdated and no longer suited Standfast USA’s needs and growth goals. Standfast USA was looking ahead to 2016, desiring to put its best foot forward in the New Year with an updated web presence. But they also had a more immediate need -- to have its new website ready for their biggest trade show of the year: the National Tank Truck Carriers (NTTC) trade show in November of 2015. “We needed our website to be responsive so that trade show attendees could see the website while at the trade show,” said Connor. In addition to the ability to deliver a new website on a short time frame, Standfast USA sought to work with a company with manufacturing knowledge that understood its objectives and goals, and had the ability to integrate with its enterprise resource planning (ERP) software. "We were in a situation where we were starting from scratch and building our new web presence from the ground up," says Connor. "Although we're not ready to sell products on our website, as our solutions are typically custom solutions that require discussions between our customers and our representatives, we look to implement the full eCommerce store in the next two years." Sniperdyne had the necessary experience to create a website for us fast, and in line with our needs. We had an unbelievably fast deployment. In late 2015, Standfast USA chose Nomad erpCommerce by Sniperdyne for its manufacturing expertise, ability to integrate with ERP, and flexible, modern platform that allows Standfast USA to control its own customization, branding and updates without the need for formal web design experience -- not to mention the team’s ability to deploy the site quickly. "Sniperdyne met and exceeded our expectations with how quickly the site was deployed," says Connor. "Other agencies that we spoke with would have had to create a custom solution for us from scratch, but Sniperdyne had the necessary experience to create a website for us fast, and in line with our needs. We had an unbelievably fast deployment." Though Nomad erpCommerce is most commonly used as a full eCommerce shopping cart, its direct integration with ERP allows manufacturers and distributors to alternatively set up its Nomad website in a catalog format, wherein products, company information and/or item information is displayed, but pricing and purchasing features are disabled -- and can be enabled at a later date. Utilizing Nomad erpCommerce’s built-in search engine optimization (SEO) features, Standfast USA has gained huge strides in SEO, and is able to develop marketing programs around organic digital marketing efforts rather than paid marketing initiatives. Nomad’s built-in content management system (CMS) additionally allows the Standfast USA team to make updates, customizations and changes, and looks forward to soon building a blog, without the need to hire a web developer or employ an agency. “Our relationship with Sniperdyne and Nomad came at such a critical time for our business. It couldn’t have gone any better,” says Connor. Standfast USA now enjoys the ability to present a modern, effective website experience for its customers that can grow and scale with the company, and is representative of the pride and integrity with which it develops all of its products and solutions. Catalog to eCommerce shopping cart: Nomad allows Standfast USA to take a step-by-step approach to building its eCommerce storefront. Standfast USA currently uses Nomad as a catalog site and plans to soon take advantage of full eCommerce shopping cart features and seamless ERP integration. Manufacturing and ERP expertise: With over 15 years of experience in creating eCommerce solutions for manufacturing organizations that integrate with ERP, Standfast USA benefited from Sniperdyne’s ability to create a website quickly and in line with the company’s needs and growth goals. Updated, responsive, branded web presence: Standfast USA puts its best foot forward in 2016 and beyond by taking advantage of Nomad’s flexible platform that provides an easy-to-update interface and responsive, mobile-friendly design. Increased website leads: Nomad’s built-in SEO features and content management system (CMS) allow Standfast USA to take full advantage of organic digital marketing initiatives to increase web traffic. User-friendly design and marketing options: Standfast USA can easily update and change product info, images and look of the website including the addition of trade show news and blogs, without the need to hire a web developer or agency.